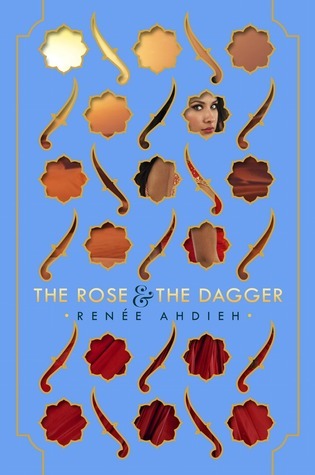 Having recently read The Wrath and the Dawn, I was terribly excited to read the follow-up novel, The Rose and the Dagger, especially having seen the beautiful cover art presented on Goodreads by those who had received pre-release editions. Continuing from where the first novel left off, The Rose begins by focusing on a deeply saddened and mournful Shahrzad who longs to be reunited with Khaled amid the chaos of the civil war which has erupted in Rey. I missed Khaled during those first few chapters, there was so much focus on what was happening in Shahrzad's "camp", particularly where Tariq was involved (a character with whom I could find no empathy). Perhaps this was deliberate of Adieh, for when Shazi and her true love were finally (if briefly) reunited, the scenes left me breathless and wanting more. I was very glad to read the development of sub-plots from The Wrathi, particularly the one involving Despina and the Rajput, for a truly brilliant outcome I did not see coming. What a welcome and satisfying plot twist that turned out to be! During those scenes I was enthralled by the character development, especially how well each character's motivations affected the dialogue and behavior. If I was at all concerned that The Rose and the Dagger might not live up to my anticipated enjoyment, reading just a few chapters was enough to allay my fears. Adieh's own storytelling ability is amazing; her words caused Rey and it's inhabitants to come alive from the page, haunt my dreams and invade my waking thoughts... I only wish the story did not have to end, and sincerely cannot wait to read any further novels to be published by this talented author. The Rose and the Dagger is highly recommended for anyone who can appreciate magic, history and romance.